In this new adaptation of the Grimm classic, director Rupert Sanders takes a gothic turn, transforming the original story into an epic revenger’s tale threaded by war, romance and sorcery. It begins just like the original in that Princess Snow White (Kristen Stewart), daughter of King Magnus and Queen Eleanor, buries her mother at a tender young age. After Eleanor’s passing, Magnus is called to war as his kingdom of Tabor is imperilled by the threat of a military invasion led by a foreign army of glass soldiers. Charlize Theron is cast as the new queen, Ravenna, a waif-like beauty who gradually becomes Magnus’ prized possession after she is recovered in a cowering and helpless state, hidden amidst the foreign fallen on a war-torn battlefield. During the night of the wedding, Queen Ravenna commits a most unholy regicide, unveiling herself as the leader of the dark forces. It turns out that the defeat was orchestrated as the evil queen signals her true army in through the kingdom gates. In the succeeding years, Tabor falls under Ravenna’s rule as she plunges it in a miasma of fear and despair. She keeps Snow White secretly locked up in a tower until early adulthood when a daring escape leads Snow White down the winding path to vengeance. In this debut feature, Sanders’ background in advertising is palpable, as his vision in the film is opulent and superficial. The subtle charm of a simple story well told is replaced by the fleeting thrills of modern pop excess. The problem is not the excess in itself but rather the fact that, even on its own consumable terms, the film is found wanting. 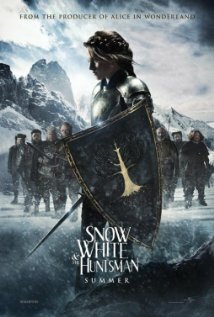 “Snow White and the Huntsman” strives to deliver the sort of entertainment that would please audiences of all tastes. It offers majestic images, an attractive heroine caught between a prince charming and rugged huntsman, battle sequences, winsome dwarf characters and an unforgettable villainess. However, as is so often the case, the outcome of having so many attractions is that virtually all of them are portrayed with little to no depth. Sanders’ symbolism is as standard as the imagery he uses to convey it. His contrapuntal use of dark-light patterns that alternate between fertile fairylands and gothic castles, white horses and ravens, and Snow White and Queen Ravenna constitute his representation of the good/evil binary. He fails to illuminate the shades of grey in between. Snow White’s romances are explored only vaguely with Sanders combining nostalgic moments and wishy-washy dialogue for easy shortcuts. In particular, his attempt to imply an unutterable complexity rooted in the romance between Chris Hemsworth and Kristen Stewart is even risible in its unintended disingenuousness. The film is only worth watching for Queen Ravenna, the necromancer whose onscreen magic salvages the conceptual wreckage. Accoutered in a raven cloak made by Colleen Atwood, the glacial image of Charlize Theron is consummated into an ultra-cool vision of doomed beauty. Her dark-heavy fashion recalls Frida Giannini’s Fall/Winter collections for Gucci and her consumption of girls in the pursuit of eternal youth inspires thoughts of Elizabeth Báthory. Whilst the film’s clumsy ending breaks the spell of her performance, Theron submits a revelatory interpretation of Ravenna. It is her inspired acting, as well as the general light entertainment, that ultimately makes this movie somewhat watchable.